This article discusses the main characteristics of Distributed Inter-Process Communication (DIPC), a relatively simple system software that provides uses of the Linux operating system with both the distributed shared memory and the message passing paradigms of distributed programming. An introduction to JPEG and wavelet transform techniques using Octave and Matlab. A talk with the head of a company using Informix SE for Linux in a point-of-sale application almost before it was announced. You voted, we counted, here are the results. 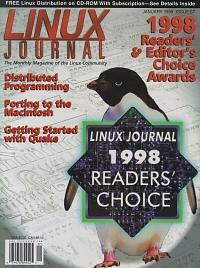 A look at the Editor's choices for best products of 1998 and why she chose them. Make working with LaTex easier by using the WYSIWYG editor LyX. Mr. Benedict show us the way to live in the home of the future by using our computer to control lights and appliances. If you think all computer professionals are men think again. Mr. Connelly tells us about some well-known women in computer annals. Dr. Bentson did a survey of Linux kernel developers to find out about their backgrounds. Here are the results. A look at the Linux kernel scheduler. Mr. Stutz introduces us to a digital method for keeping track of appointments and those important dates in our lives. Linux is being used in a Taiwan hospital as a server for medical images and as a firewall. Improve your users' browsing and save your bandwidth by using proxy servers to cache web pages. “I don't care if space aliens ate my mouse” or a case study in both the technical and human issues in porting the Linux OS to a new M68K target platform. Ready to create your own virtual community? Here's how to begin. Here's how to set up a web server using another freely available operating system, FreeBSD, a high performance, mature, UNIX-like system.